I thought that Alex Garland could do no wrong. This is the man behind the novel ‘The Beach’, the screenplays for 28 Days Later…, Sunshine, Never Let Me Go and Dredd, writer of the video game ‘Enslaved: Odyssey to the West, and writer/director of Ex Machina. But it turns out the man has his limits. Based on the novel by Jeff VanderMeer, Annihilation starts off much like 2016’s Arrival: a grieving academic is brought in by the Government to investigate a mysterious phenomenon that hovers over the land. Problem is, the first half hour of Annihilation has none of the narrative drive that was so effective in Denis Villeneuve’s film. Natalie Portman plays Lena, the ex-military biologist who joins a group of fellow scientists. Jennifer Jason Leigh, Gina Rodriguez, Tuva Novotny and Tessa Thompson make up a dream team of experts who head into the unknown with her. Problem is, all of them are depressed to begin with, and as soon as they enter the mysterious zone, they generally wander around in a daze. They’re all loners and have no interest in their colleagues either, so there is nothing for the audience to hang their hopes and fears on. The languid pace doesn’t help. This comes as a real surprise after Garland’s directorial debut, Ex Machina, where the story beats came thick and fast, and I was always anxious to see what would happen next. This kind of narrative tension is completely absent in Annihilation. Another surprise is that the score, composed by Geoff Barrow and Ben Salisbury, doesn’t work either, despite their stellar contribution to Ex Machina. Well, it doesn’t work until the last ten minutes, but by that stage it’s too late. If anything, this movie feels like a directorial debut. I’m completely mystified how Garland screwed this one up. I haven’t read the book on which it’s based, but VanderMeer’s ‘City of Saints & Madmen’ sits proudly on my shelf, and I can recognise his work in the film. This will get lumped in with the likes of the much-maligned The Cloverfield Paradox – another film that skipped cinemas to go straight to Netflix – and yet that very silly sequel was at least entertaining. Annihilation is a hard slog to get through, and despite a couple of excellent scenes and a handful of good ideas, it fails to impress. 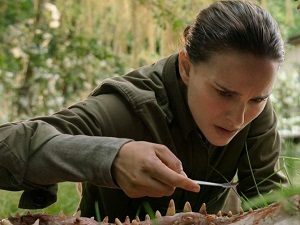 Annihilation is available now on Netflix. This entry was posted in Film Reviews and tagged Drama, Science Fiction by Stuart Wilson. Bookmark the permalink.